Known as the birthplace of the big fat Indian wedding, Delhi is indeed a wedding wonderland, housing some of the best 5 Star wedding venues in the country. Delhi is truly representative of luxury - bigger houses, broader roads, lots of green, haute couture and wedding bling included. Whether you have attended a Delhi wedding or not, Bollywood movies from Monsoon Wedding to Band Baaja Baaraat give us a little glimpse of what Delhi weddings are made of. 5 Star wedding venues instinctively are the preferred choice of Delhiites, when it comes to hosting lavish weddings. To save you from all the leg work and the high and low research struggle, we unveil our list of Popular 5 star wedding venue in Delhi and give you a sneak peak into what they have to offer. Take your pick! First on our list of 5 Star wedding venues in Delhi, Country Inn & Suites by Carlson is strategically located with close proximity to all transport hubs making accessibility a hop, skip and jump away. What instantly hits the guests at this venue is the old world charm it offers. The sleek and sophisticated interiors with vintage chandeliers being the highlight of banquets spill luxury. You can choose from any of their 7 banquet halls each with varying capacities that can comfortability accommodate your guest list. For large celebrations their grand ballroom with attached Darbar hall can house more than 1000 guests. Their dedicated wedding planning team will assist you right from planning your wedding to vidaai. Whether it’s the décor or customized vegetarian menus, their expert in-house staff will look after your specific requirements. Complimentary changing rooms are provided for the bride and groom. With these and much more amenities offered with high-class service, having your wedding at Country Inn will certainly be an outstanding celebration. High level of sophistication and splendour is what fills The Leela Palace at Chanakyapuri. Each nook and corner so intricately designed is sure to leave your guests spell bound. Vintage interiors take you back to the British Era. Their majestic ballrooms are fit for intimate to medium-sized celebration. If you’re looking to take your celebration outdoors, The Leela’s Palace Terrace is an ideal location to host a dreamy wedding. The venue will look after your personalized décor, food and music arrangements. You can hire your own DJ if you like. The venue offer complimentary valet service. While the former is perfect for small gathering celebration, Leela Ambience Convention Hotel in Karkardooma is where you can have the larger than life Delhi wedding. It features a large venue space with jaw-dropping interiors that will make your guests go gaga over your wedding venue choice. 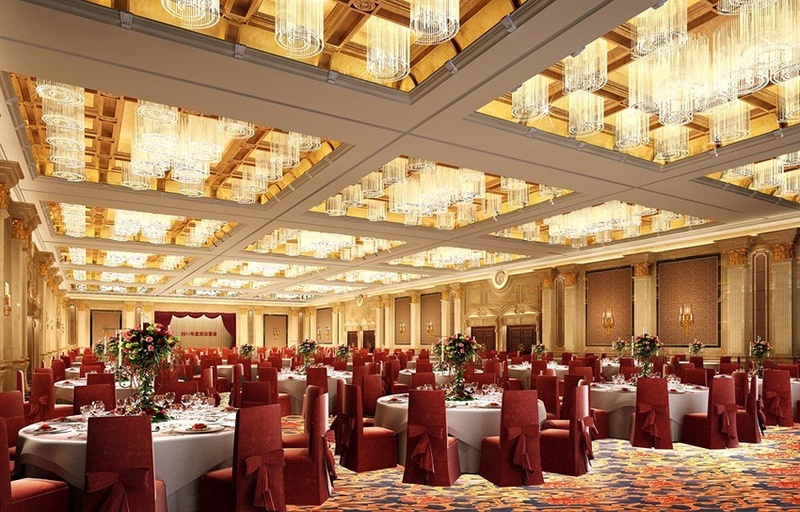 Articulately designed banquet halls stun spectators with a mere gaze at it. Choose from its 6 banquet halls or 2 spectacular lawns if outdoor wedding is on your mind. Matching its spectacular ambiance, the staff ensures the service is no less than exceptional. Though from planning your celebration, decorating the venue to customizing the menu is handled by its in-house staff, the venue lets you make your own alcohol arrangements. From your pre-wedding festivities to big fat Indian wedding celebration, Taj Vivanta has got you covered. With a record of hosting Delhi’s grand weddings that have become the talk of the town, Taj Vivanta knows exactly what clicks with modern couples and their contemporary requirements, which flawlessly reflects in its interiors. From their lobby, rooms, poolside area to banquet halls, stylish designs dominates the look and feel of this grand banquet hall in Dwarka Delhi has to offer. Their banquet halls are equipped with soundproof ceilings that allow you to party all night long with the best choices of music played by their in-house DJ. When booking Taj Vivanta, you needn’t worry about the décor and food arrangements either; their expert staff will take care of it. However, you can make your own alcohol arrangements with corkage charges applicable. A neo-gothic theme styled lobby is what welcomes you at the Radisson Blu, which doesn’t fail to cast a spell on guests who enter this royal 5 Star wedding venue in Delhi. The venue provides multi-purpose banquet halls that can be divided in 4 sections or combined to host a grand wedding affair. Their expert wedding planning team is at your assistance at all times should you need any anything at all. Their culinary experts throw a variety of Indian to Italian cuisine options at you, giving you an open window of what all you can offer your guests. Here too, the venue allows you to make your own alcohol arrangements, while they superbly take care of your décor, food and music requirements. One of the most exquisite 5 Star banquet hall in NH 8 is The Westin. From varied capacity banquet halls for pre-wedding festivities or small gathering wedding to a plush green lawn available to host a grand style wedding, this wedding location in Delhi is a dream come true for many couples across the city. Well carpeted flooring, spectacular interiors and outstanding service from their talented staff is what makes The Westin the top most choice for Delhi weddings. In addition to the venue taking care of your décor, food arrangements, music and alcohol, if your guest list crosses a little over 300 guests, you’re provided with complimentary changing rooms for the bride and groom. A 5 Star experience can’t get better than this! Another gem 5 Star wedding venue in Delhi is the Crowne Plaza. A well-known brand in the hotel industry known world over, at this IHG brand of hotel world-class service is guaranteed. State-of-the-art interiors and high-tech lighting equipped banquet halls wait for you to welcome your guests at this breathtaking hotel. For a large gathering celebration, Crowne Plaza lets out its well-manicured lawn areas where you can host a glitzy, glam wedding. Their staff will help you be by your side at all times ensuring personalized and excellent service is offered to you. Located in one of the most popular localities of the city, lies one of the best 5 Star wedding venues of Delhi, Novotel. Give your guests a grand welcome and let them relish on the lip-smacking dishes served by the culinary experts at this hotel. You can arrange for your DJ, while rest of the elements of your wedding will be taken care of by the venue. Should you want the venue to be decorated your way and you have a decorator in mind that can do a swell job, the venue allows outside decorators at its premises. Complimentary changing room is provided for the bride and groom, as well as complimentary valet services. “WOW” is what you’ll hear your guests cry aloud once when they step into the Sheraton. This gorgeous 5 Star banquet hall in Saket provides stunning ballrooms, as well as its poolside area for magnificent weddings. The most mind-blowing aspect of this venue is that it allows you to make your own arrangements for music, décor and food. You’re not bound by the services of its venue. Simply book either of their venue space and have the complete luxury and freedom to design the other elements on your own. Complimentary rooms for changing and complimentary valet service is provided by the venue. These were just our top picks. Check out more such amazing 5 Star hotels here.